Finally back to work buildin' frames after a long break for NAHBS. Feels good! 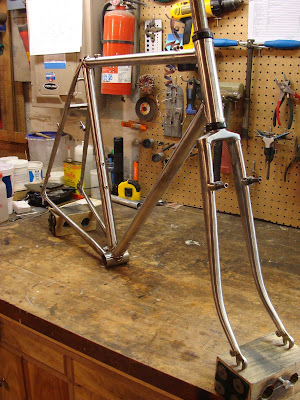 First up is Carl's multi purpose cross frame. 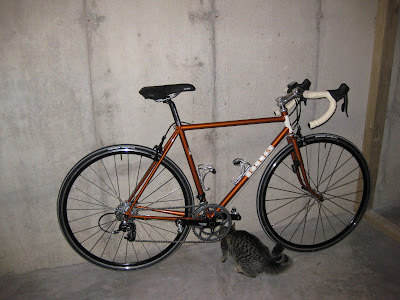 I went with an old school Columbus SLX tube set and a set of Long Shen's Cinelli copy lugs. We're going for as much functionality as possible, so I used some of my old Campy 1010a dropouts so he can run it single speed or geared and I added a bunch of braze ons to hopefully cover any eventuality! 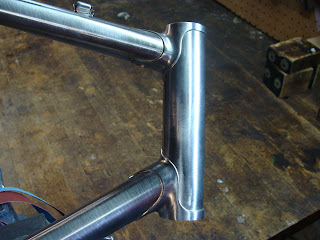 Here's a shot of those nice Long Shen head lugs, very clean and nice. The seat cluster area, lots of stuff going on here. You can see the top tube cable routing, (which I don't normally do), a beefy canti brake bridge, and the hidden rack mounts on the inside of the seat stays. What you can't see here is the internal routing for the front derailleur cable. Since Carl was only going to run a front changer infrequently, I routed it under the top tube internally. This way, when it's not being used, you don't have open cable guides except the one on the back of the seat tube. 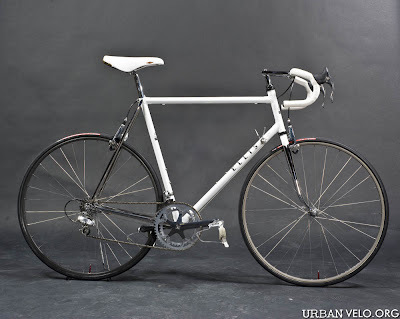 The seat stays are the only non SLX tubes, I upsized a bit and ran some double tapered 16mm's instead of the 14's that come with an SLX set to better handle the canti brakes and a potential rear rack. I really tapered the caps as well so the stays don't look quite so beefy where they meet the seat lug. I bumped the chainstays pretty deep for lots of extra tire and fender clearance. You can just spot the boss in the bridge for mounting a fender and the 3rd set of water bottle bosses under the down tube. 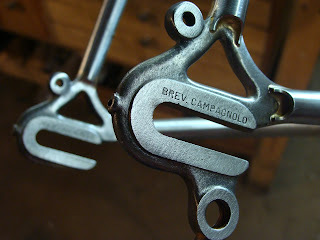 Oh yeah, the vintage Campy dropouts. If you look close you can see the pitting from some years of rusting away at the Paramount and later Waterford shop. Saved a pile of these from the dumpster during my Waterford days. A little vinegar and salt soak and they're ready for action! I've mentioned before that Caitlin was nice enough to let me hold onto her frame for a couple extra weeks so I could show it at the NAHBS in Richmond. Well, we're back, and she made the trip from Madison on Sat. to pick up her new Ellis. Didn't waste any time getting it built up either! I'm looking forward to a ride report soon. As you can see, Caitlin has her own version of the Ellis Cycles "Inspector". I've had a couple days to recover and I thought I'd try to share some of my impressions of the NAHBS in Richmond. Firstly, a huge thanks to Don Walker for all the time and effort that goes into planning and putting on what has become the premier show for small builders. 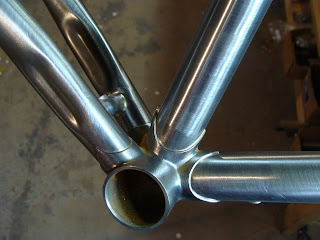 I talked to so many people over the 3 days of NAHBS, and got such great feedback on my frames. Folks commented on how clean, simple and classic they looked, and that's exactly what I'm going for every time I start a frame. I'm honored that the judges felt my frame was "Best in Show", but I'm sure there were at least a dozen other frames that could easily have won in it's place. 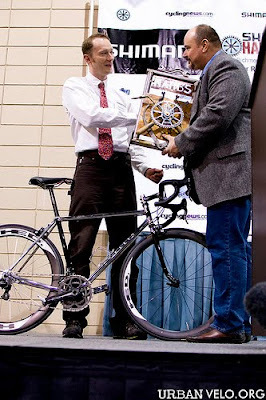 Another cool part of winning the award was the fact that Patrick, the owner of the winning bike, had flown in from San Francisco the day before to see his new bike and look around the show. I'd never met him in person before, and when he saw his bike for the first time and introduced himself, he was beaming with excitement. This is really what makes building frames on my own worthwhile. Meeting the customers face to face and getting all the feedback on my frames has been amazing. I also got to meet Chad, the owner of the Richard Petty tri bike. He was nice enough to drive it up from NC on Friday morning and then make another trip to pick it up on Sun. He's a heckuva nice guy too and was excited to get some miles in before his first triathlon in a couple weeks. I can't wait to hear how the new Ellis works for him. I can't end the post without thanking my painter, Jason Sanchez as well. Without his huge effort over the last couple weeks before the show, I might have only had one or two bikes to show instead of the four that finally made it. And finally, a huge thank you to my wife for putting up me during the weeks leading up to the show and all the stress that comes with it! I really truly couldn't do what I do without her.